10.25 inch PVC Roof / Deck Drain. Solvent Weld Drain outlet 4-inch Schedule 40 Drain Pipes. Molded PVC body, epoxy coated cast iron clamping ring with integral gravel stop, polyurethane dome, hardware. Price/Each. 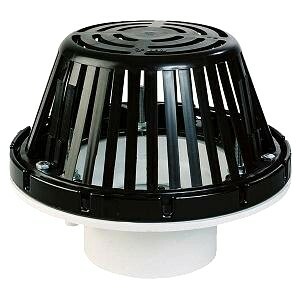 Drain construction is a molded ultraviolet stabilized 5" high polyethylene dome strainer, a 10.25" diameter epoxy coated cast aluminum gravel guard and clamping ring and an injection molded ultraviolet stabilized PVC drain body. 9.5" diameter x 5" high poyurethane strainer / drain dome. 10 In. PVC Roof / Deck Drain Kit. Outlet fits 2 In. Drain Pipes. Complete with molded PVC body, epoxy coated cast aluminum alloy clamping ring with gravel stop, polyurethane dome, cast aluminum under deck clamp, rubber coupling, Hardware. Price/Kit. 10 In. PVC Roof / Deck Drain Kit. Outlet fits 4 In. Drain Pipes. Complete with molded PVC body, epoxy coated cast aluminum alloy clamping ring with gravel stop, polyurethane dome, cast aluminum under deck clamp, rubber coupling, Hardware. Price/Kit. 12 inch PVC Roof / Deck Drain. Solvent Weld Drain outlet fits 6-inch Schedule 40 Drain Pipes. Molded PVC body, epoxy coated cast iron clamping ring with integral gravel stop, polyurethane dome, hardware. Price/Each.